My short story, "A Knot Of Toads", has just been published in Black Static #38 and as usual I'm blogging about the genesis of the story for those who might be interested. There may be spoilers for those who haven't yet read the work. Several ideas for this piece came about whilst I was on holiday in the Lake District last year: the diversity of tourists at Ambleside, the line about Cumbrian female accents sounding like men would sound if they were women (not intended to be disparaging, this is my character's view not mine! ), and the "can I take your picture" line as an intro to picking up solo female travellers. Meanwhile my partner had come across a list of collective nouns for animals and thought some of them would make good titles or jumping off points for stories. I agreed, and this idea was knocking around in my head for a while like a fly in a glass box, until I realised that the outdoors-ness of the nouns would tie in with my Cumbrian story. 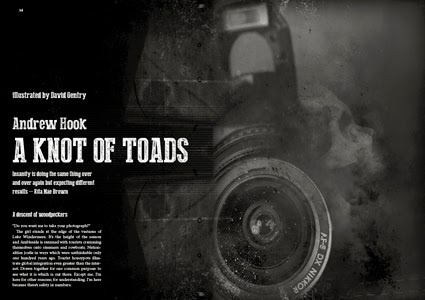 I tried to avoid the obvious (a murder of crows etc) and a knot of toads suggested a complex immersion in nature and it fit as a title, with other collective nouns as section headings. The crux of the story is about a protagonist who believes he is instrumental in causing deaths after he has taken someone's photograph. These are natural deaths. He attempts to assimilate these coincidences rationally, has believed that seeing groups of animals is a harbinger for what occurs, but really he is fighting to impose a structure on something that isn't structured. At the end of the story my intention is to show that in fact there is nothing supernatural behind this, it is totally random. Given an infinite amount of time all permutations of existence are possible, as are aberrations. That's my reading of the story, anyway, although more traditional readings are also possible; my intention is that he feels bound to something where he is only a coincidental observer and any attempts to rationalise it are useless. If you've read the story, I'd be interested in your comments. 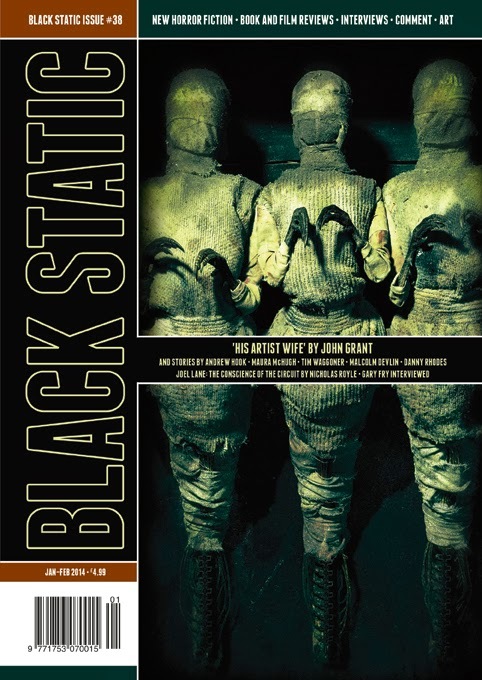 Black Static #38 also contains stories by John Grant, Tim Waggoner, Maura McHugh, Danny Rhodes and Malcolm Devlin. The issue is dedicated to the memory Joel Lane, and Nicholas Royle pays tribute in "The Conscience of the Circuit". Further information here.